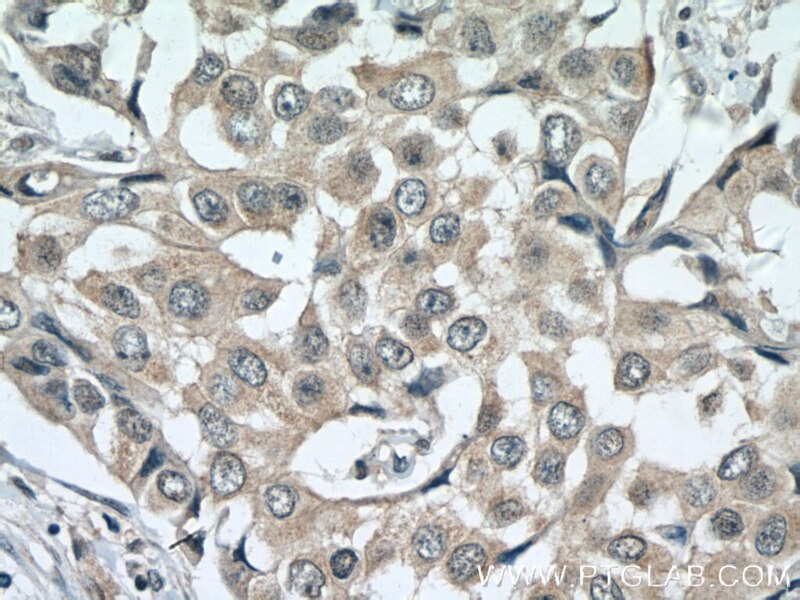 Immunohistochemical analysis of paraffin-embedded human breast cancer tissue slide using 11023-1-AP( ACTR1B antibody) at dilution of 1:200 (under 10x lens) heat mediated antigen retrieved with Tris-EDTA buffer(pH9). 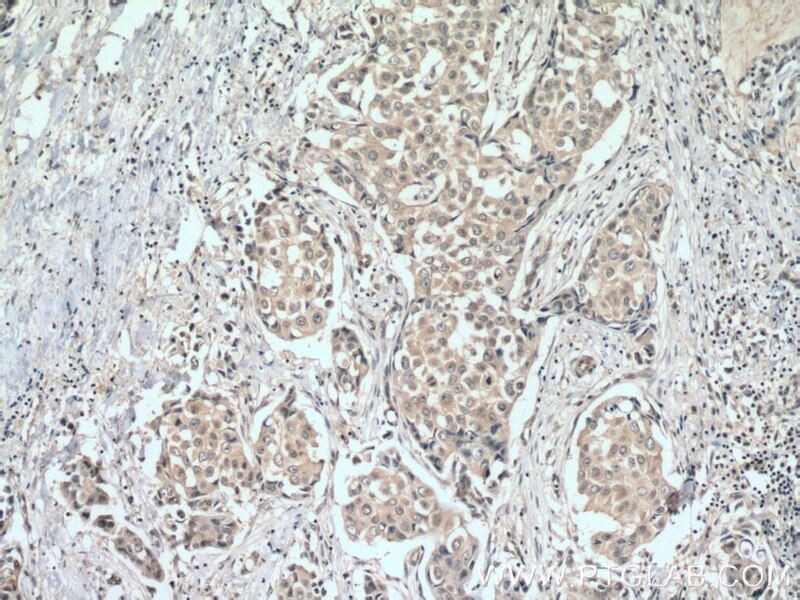 Immunohistochemical analysis of paraffin-embedded human breast cancer tissue slide using 11023-1-AP( ACTR1B antibody) at dilution of 1:200 (under 40x lens) heat mediated antigen retrieved with Tris-EDTA buffer(pH9). 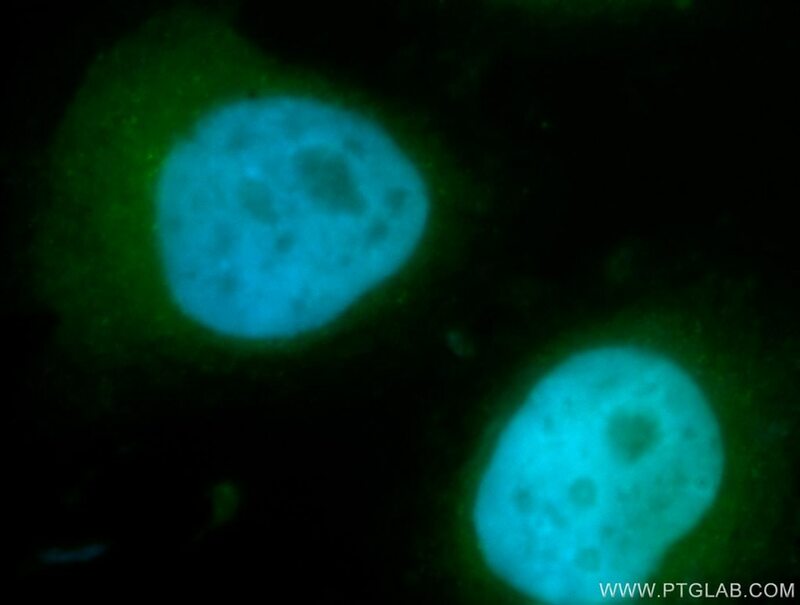 Immunofluorescent analysis of MCF-7 cells, using ACTR1B antibody 11023-1-AP at 1:50 dilution and FITC-labeled donkey anti-rabbit IgG(green). Blue pseudocolor = DAPI (fluorescent DNA dye). ACTR1B (also known as beta centractin) is a part of the 20S dynactin complex. It colocalizes with centrosomes and vesicular (membranous) structures and is involved in cell division. ACTR1B and ACTR1A share 90% amino acid identity, and this antibody recognizes both of ACTR1B and ACTR1A.